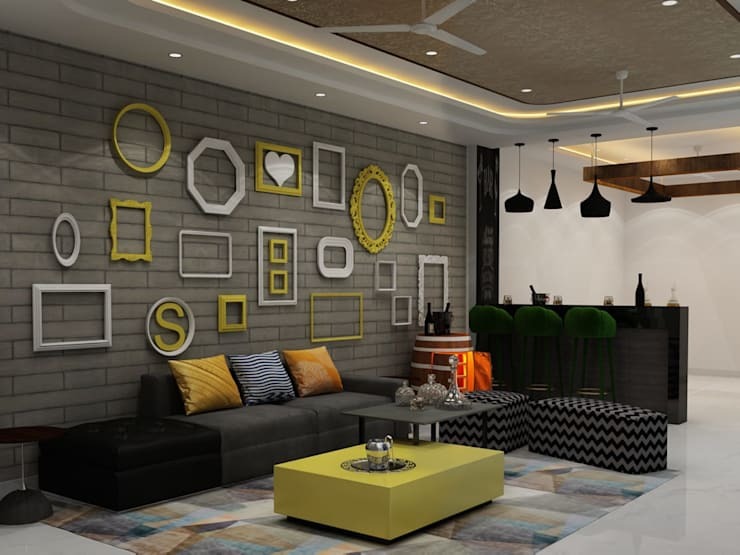 This residential project in Delhi is definitely one to watch out for. 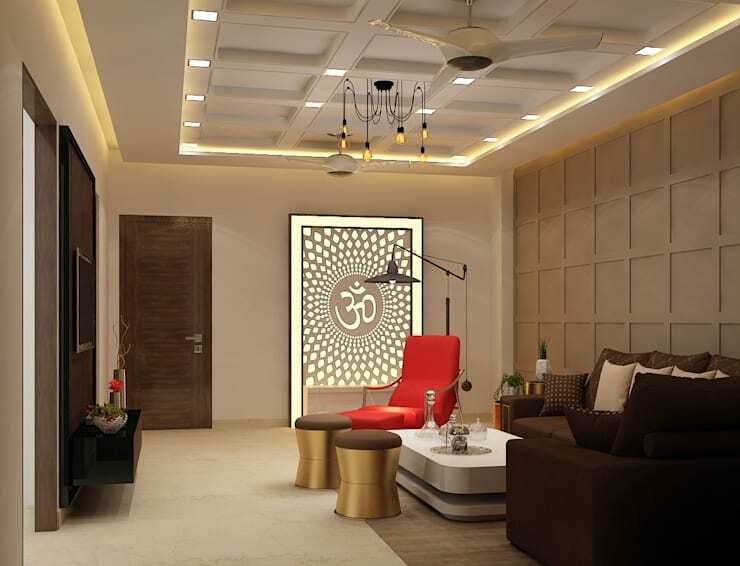 Designed by MAG Consultancy, Interior Architects in Delhi, this home is quite different from the usual residence. 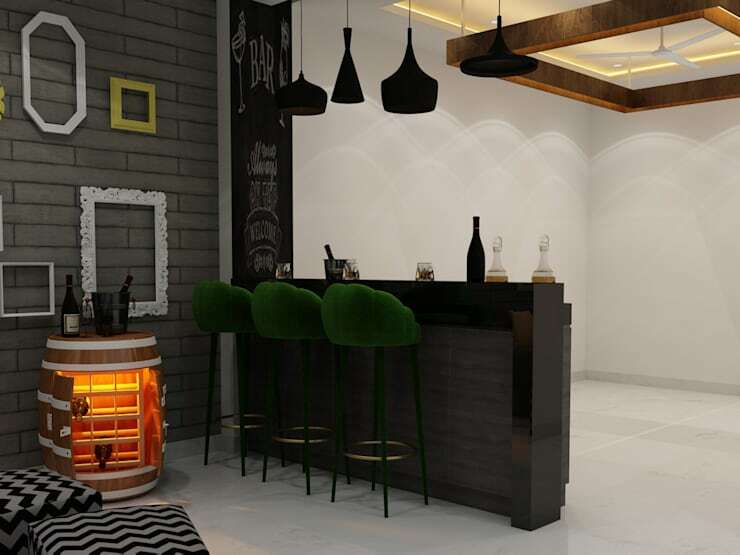 This is because of the unique colour scheme, decor and the overall vibe of the place. 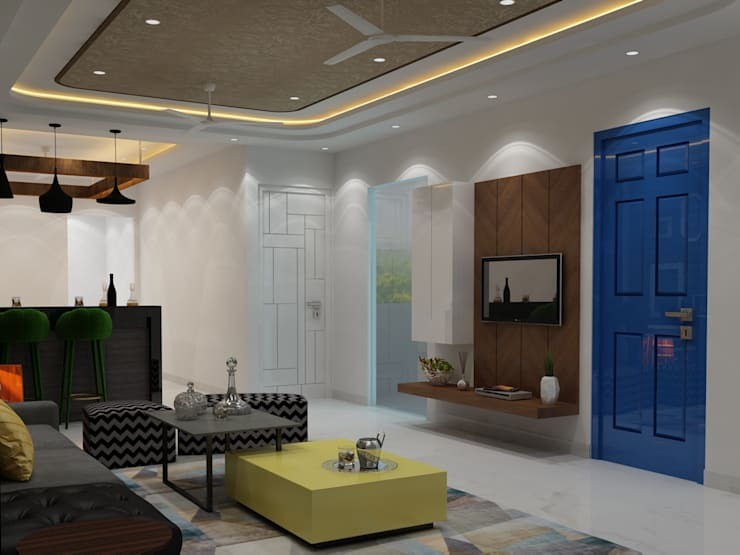 So let’s take a tour and explore this beautiful home with modern accents, colours and stunning decor. Our first glimpse itself is so impressive, that we are quite excited to see what is in store for us. This beautiful bar on the side of the living room has the perfect ambience. The cast iron hanging lamps, the industrial style and minimalistic bar made of marble and concrete looks perfect here. The green velvet bar chairs are of course the perfect match for this bar top. On the side, we also have a smart idea, using a barrel to display and hold wine bottles and glasses. From the first glimpse, we saw that the colour scheme used is mostly grey, black and other neutral colours. And honestly, that works out quite well for the designers. The need to not use any bright colours that are harsh to look at is a smart idea. 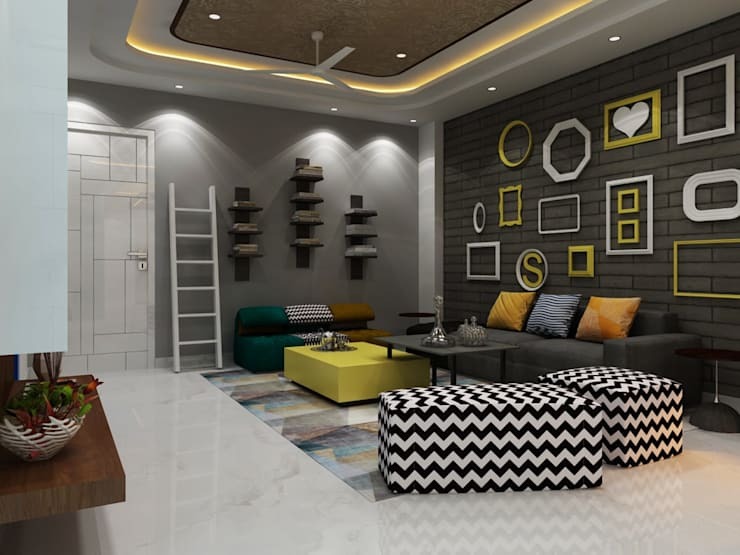 The colours here are soothing and the soft yellow that is used on the walls and in the furniture really makes the whole room pop. Here, we see that the house follows a geometrical design theme, more or less. The door we see has a rectangle geometric design in white wood, and the furniture has a varying geometric pattern as well. The designers have kept everything minimal. For example, on the right side, we see an elegant wooden panel for the TV, but they have not gone overboard with their use of this material. We also have a uniquely designed centre table, custom made for this home only. It is all about the wall décor. As we can see here, the large wall in the living room is decorated with wooden cutouts, painted a soft yellow and a bright white. This contrast on the industrial finish grey wall is gorgeous. On the other side is a softer shade of grey. We can see some wall-mounted shelves, which almost look like they are floating! A closer look at the furniture shows us the mix and match of colours and patterns sued here. 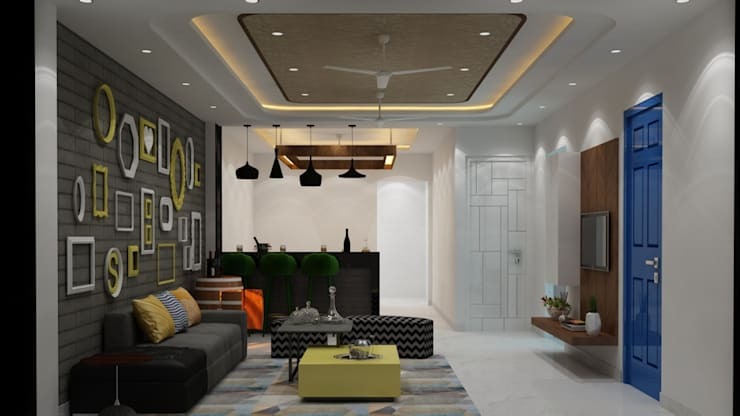 The ceiling design is also a mix of white and a soft shade of greyish-brown. The lighting really brings out the contrasting colours. While we saw a more minimalistic look outside. We see a more elegant and sophisticated design here. 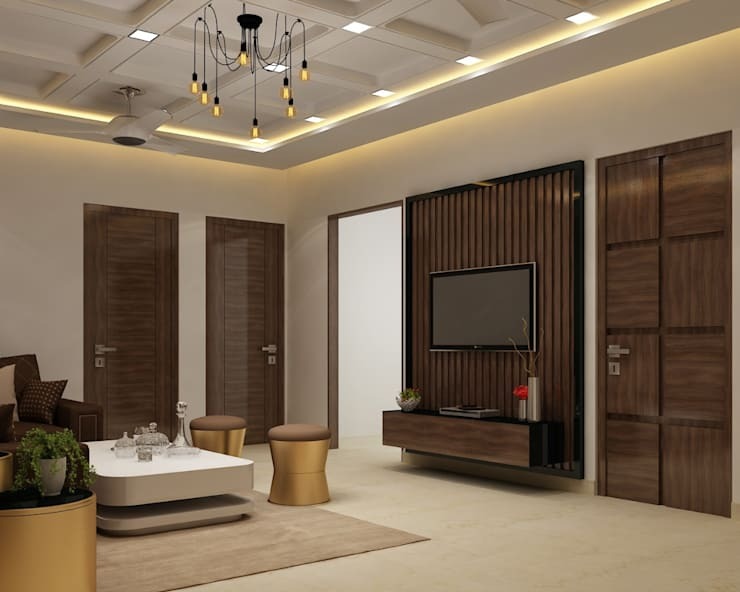 The wooden panelling used in various places looks beautiful. The flooring is simple white marble. But the furniture with a metallic finish is really the highlight of this room. What is a room without just one pop of colour? Here, we see that the red comfortable armchair is the only pop of colour, which allows the softer shades to shine through as well. The OM on the side, with proper backlighting, looks elegant and right at home here. The Makeover of an Unbecoming Living Room.